I just got done reading To Kill A Mocking Bird, for the second time. I was a kid the first time I read it and I didn’t understand it. Anyway, as soon as I finished it, I watched the movie. I’m now in love with Boo Radley aka Arthur Radley. (For those who don’t know him, he is a character who is left a mystery and has not more than 3 minutes of on-screen time). But the way Harper Lee has written about it made me cry when Scout saw Boo. And the execution of the scene in the film is superbly done as well. Naturally, I fell in love with him and went to ‘Like’ the Boo Radley page on FB (because if one does not represent his like on FB these days, it isn’t counted. Sigh). I was surprised at what I saw. It was a rock band page called The Boo Radleys. I read up a bit more and saw that The Boo Radleys was an alternative English rock band named after the character. They were alive and kicking from 1988-1999 and have five albums and quite a few singles under their name. I was surprised to see that they were quite a well-known band. But I don’t think they really have songs about Boo Radley or anything to do with To Kill A Mocking Bird. So I decided to look up more such bands/songs. It is common knowledge that Lord of The Rings has a tonne of songs written about it in the list of all-the-world’s-music archives. Best known among songs are those by Led Zeppelin I’m sure. The Battle of Evermore, Ramble On, Bron-Y-Aur Stomp and Misty Mountain Hop. Robert Plant sings about ‘the darkest depths of Mordor, I met a girl so fair. But Gollum, the evil one, crept up and slipped away with her,’ and ‘The pain of war cannot exceed the woe of aftermath, the drums will shake the castle wall, the ring wraiths ride in black,’ Wow just thinking about these connections somehow makes me go back to that age. I know I wasn’t born back then but this connection makes everything come alive, sort of, doesn’t it? While we’re discussing Tolkien, there is a huge list of bands I must mention. Of course, it helps all rock bands that Gandalf was a pot smoker. So, obviously, Black Sabbath sang about him in their song Wizard. Other well known bands, (that I didn’t until now know got their names from LOTR) are Gorgoroth, Norwegian black metal band. They are named after the dead plateau of evil and darkness enclosed by the Ephel Duath mountains in Mordor. Also, Amon Amarth, Swedish death metal band. Amon Amarth is the elvish name of Mount Doom. Who knew! I know my friends even listen to these bands. But not once had I given a thought about their names. Did you know, that there is a band called Cirith Ungol (pronounced Keerith Oongol)? LOTR readers will know that it was one hell of a maze on the way to Mordor and Cirith Ungol was part of the maze. It was also the place where Shelob reigned (In Elvish it means “Pass of the Spider”). Shelob was a wicked giant spider who engulfed any enemy in her web and ate them. So the band named after Cirith Ungol formed way back in 1972. They were a heavy metal band. Their other choices of names were Minas Tirith, Khazad Dum and Uruk Hai. Gosh Uruk Hai? Seriously? I hated that ugly prick! i’m still reading up, and if I list all LOTR bands, it’ll take up this entire post space. And I’m hardly doing a 5000-word thesis. So let’s just say almost all the “cool” sounding characters, mostly the bad ones, have bands named after them. Oh and also, there was a very famous band called Hobbit that was active in 1980’s. Moving on, up next is Harry Potter. 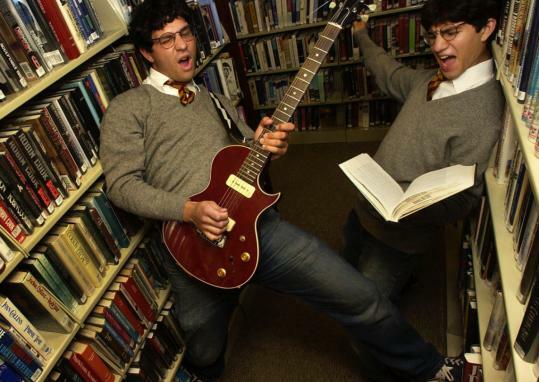 Apart from Weird Sisters, (HP readers will know what I’m talking about), there is an American band called Harry and the Potters. They are not only a music band, but they also perform plays and they’re still active. Their albums are titled Voldemort Can’t Stop the Rock and Power of Love. Personally, what I love is that there is a parody of this band called Draco and the Malfoys. I absolutely relish these Gryffindor-Slytherin wars. They’re so entertaining! This is weird, because I didn’t know which other book to look up and randomly typed in Jane Eyre. And I actually found a song on Youtube by a Jane Eyre Rock Band. That’s just so bizarre. Can’t possibly put the two together. I suppose Google can throw up an answer for absolutely anything! Well, I’ll keep researching and adding stuff to this post. If you know of any band, feel free to let me know.